Saint Lucia for Honeymooners | UNIGLOBE Direct Travel Ltd.
Planning a honeymoon? Consider Saint Lucia, it has just been voted one of the most romantic honeymoon destinations. 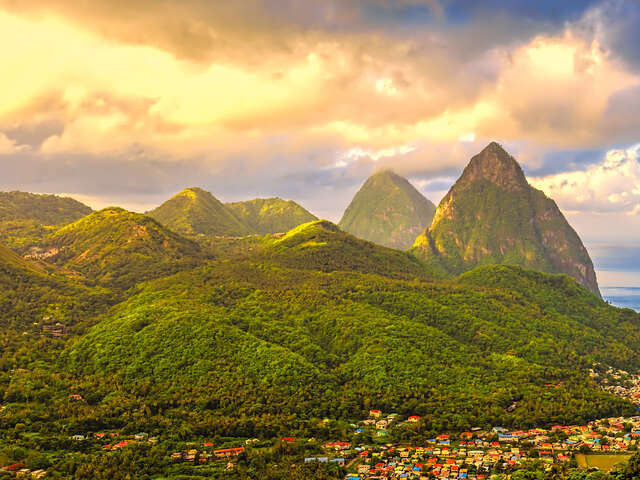 Saint Lucia is known for its twin green Piton mountains, but it is most famous with honeymooner for its romantic vibe, beautiful scenery and relaxing atmosphere. It should come as little surprise that Brides Magazine recently awarded Saint Lucia with place in their Most Romantic Destination for Honeymoon Travellers list. The tropical island was only beat out by French Polynesia and Italy. Other countries awarded this title are Maui (Hawaii), South Africa, the Maldives, Mexico, Fiji, Kauai (Hawaii), Seychelles, Jamaica, Greece, Turks and Caicos, the British Virgin Islands, Bali, Thailand, Hawaii (the big island), Nevis, France and the Dominican Republic.